I just love the way that they look. Stores now sell these apples for $5 to $10 dollars an apple, which is absolute craziness. I mean, they're delicious and look beautiful, but that's a lot of money for a fancy apple. Speaking of trendiness, lavender has really come a long way. When I was a little kid, I thought lavender was a smell that only belonged in lotions and bath products. Now, they make lavender cupcakes, cookies, lemonade - you name it! This recipe is simple and takes advantage of the lavender craze. Plus, two of my friends are lavender fanatics; I'm looking at you, Laura and Maddie. To make your own lavender sugar: take 1 tablespoon of culinary grade lavender and grind it with a mortar and pestle. You want to release the lavender oils and flavors. Combine this with some coarse, organic sugar, about 1/3 to 1/2 cup (depending on how strong you want the lavender flavor). Boom. Now you're fancy with your lavender sugar. to 7 minutes, swirling the pan occasionally to ensure even browning. Remove from heat and carefully whisk in the shortening, milk, and salt. Return to heat and continue cooking for 15 minutes. As you remove it from the heat, add your bourbon while continuing to whisk the caramel. It should be thick enough to coat a spoon. Cool to room temperature. If the caramel hardens too much, put it back on the stove under low heat. It will soften up. Assembly: insert a stick or skewer into your apples, right where the stem meets the apple. 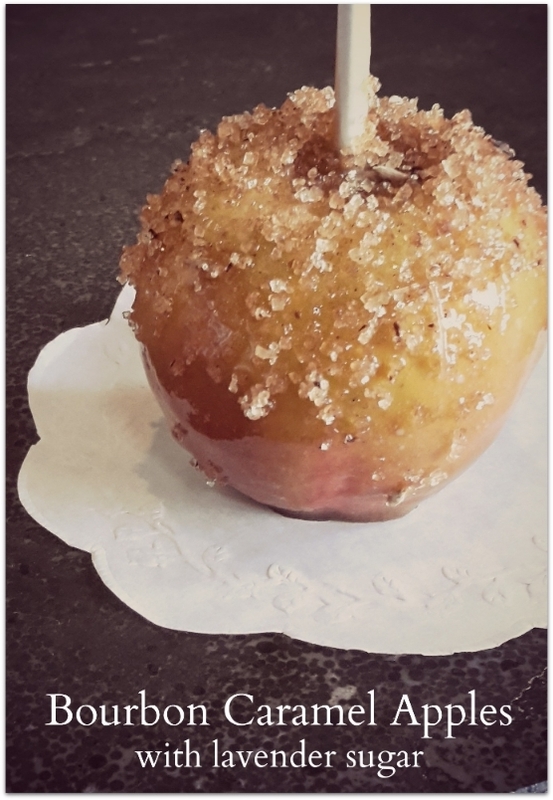 Using your stick, swirl the apples around in the caramel to ensure even coating. When you're done, place them on a piece of parchment paper to harden. Sprinkle the lavender sugar on the apples immediately, before they harden. Enjoy these apples and let me know what you think. People will think you're so fancy! They make great gifts.